Technology in general is accelerating by leaps and bounds, and the technology involved in dentistry is no different. However, it’s important to recognize that technology does not mean anything without the expertise to go with it. What makes the biggest difference in modern dentistry is not only state-of-the-art equipment, but the knowledge of how to use that equipment to give patients the best possible experience in the dentist’s chair. In addition, the latest technology can also help patients live a life with better oral health, which in turn can lead to better overall health. One of the most important advances in dental technology is the development of laser dentistry. Lasers can make dental procedures less painful, faster, and can help improve and reduce healing times. 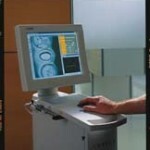 Lasers also help patients by allowing for less invasive procedures. There are many ways that laser dentistry can help you reach your dentistry goals, including gum re-contouring and periodontal treatments. With re-contouring, the gums are reshaped by laser to even out the gum line and lengthen teeth, while periodontal treatments kill bacteria and cut away diseased tissue in a very precise way. But lasers are only one technological advancement that dentists use. Digital Smile Design allows the dentist to use a computer representation of a patient’s mouth to show them what their smile would look like with some aesthetic improvements. The patient can then see how they would appear after restorations or cosmetic dentistry, which in turn allows them to make informed decisions regarding which procedures they want to have. Computer-based bite analysis, on the other hand, is less about cosmetic appearance, and more about fixing neuromuscular issues like TMJ disorder. For those suffering from unexplained headaches, jaw pain, or neck pain, bite analysis can give invaluable information that can help the dentist correct fundamental issues with bite and jaw placement. Many times, simple procedures can lead to dramatic improvements and relief from pain. These are just a select few ways that dental technology is making people’s lives healthier, easier, and happier. Even if you just come in for regular checkups, the systems the dentist uses to keep track of your oral health are much better than they were even just ten short years ago. As time goes on, of course, the technology will only get better, which means the dentist will be able to help even more patients have the best oral health they can possibly have, for the rest of their lives.